Retroperitoneal access is obtained by an open technique (3). The primary incision is placed below the tip of the 12th rib. The skin, subcutaneous tissue, and external oblique fascia are incised sharply. The fibers of the internal oblique and transverses are separated bluntly with the index finger up to the level of the dorsolumbar fascia, which is divided sharply to gain entry into the retroperitoneal space. The retroperitoneal position is confirmed by palpating the psoas muscle posteriorly and the lower pole of the kidney superiorly. Initially, the retroperitoneal space is developed with the help of the finger. A variety of devices have been used for subsequent rapid development of the initial working space during retroperitoneoscopy. Simple contraceptions such as rubber catheters attached to a latex glove or condom though inexpensive, in our opinion, are not very efficient. We prefer to use the PDB™ balloon dilatorb to balloon dilate the retroperitoneal space for several reasons (Fig. 2). First, the balloon dilator has a rigid shaft, thereby enabling optimal positioning of the balloon in the retroperitoneum. Second, the balloon dilator has a transparent cannula and balloon through which a 10 mm laparoscope can be introduced to confirm proper positioning. Visualization of the psoas muscle inferiorly and the perinephric fat superiorly confirms the correct balloon position between the kidney and the posterior abdominal wall. Occasionally, other retroperitoneal structures, such as the ureter, gonadal vein, and inferior vena cava may be identified through the transparent balloon. Third, since the balloon lies entirely in the retroperitoneum, inflating the balloon does not widen the initial incision made through the skin and abdominal wall. The balloon dilator is incrementally inflated up to 800 cc (each pump delivers approximately 20 cc air) (Fig. 3). 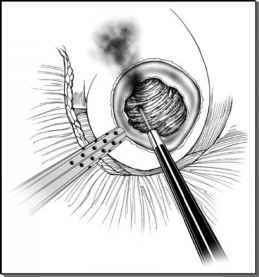 Subsequently, a 10 mm blunt tip balloon trocar is inserted through the incision (Fig. 4). The balloon port provides optimal sealing of the abdominal wall, thereby minimizing leak of CO2 and subcutaneous emphysema. This is of critical importance, given the already limited working space in the retroperitoneum (3). FIGURE3 ■ An inflated balloon dilator. FIGURE4 ■ Blunt tip trocar. FIGURE 5 ■ Electrosurgical scissors. FIGURE6 ■ Electrosurgical electrode tip.